Our annual holiday dinner was held on December 16th at The Jägerhaus Restaurant at 2525 East Ball Road in Anaheim. Tickets were $21. The dinner was extremely well attended. The grand raffle prize was an ICOM IC-7000 that was won by Dan Dankert - N6PEQ. Taka Nakayama - KW6I and Jeff Reinhardt - AA6JR of AOR Inc. presented a program and impressive demonstration on digital voice communications using AOR's new ARD9000 and ARD9800 digital modems. These units work with existing transceivers without any modifications. The 2005 ARRL Southwestern Division Convention was held in Riverside, CA at the Convention Center. Attendance by OCARC members was heavy. Ward Silver, Author of Ham Radio for Dummies was the banquet speaker. Jim Shryne - N6DHZ gave a slide presentation on the KFI 50,000 watt transmitter. He also showed pictures of the main KFI antenna tower prior to the recent aircraft collision that collapsed the tower to the ground. OCARC said farewell to two of our members and past Presidents at a special dinner held at Marie Callander's, 307 E. Katella Ave. in Orange. Bob - K6BWH is heading for Sheldon, North Dakota to run a fuel distribution business. Frank - WA6VKZ is moving to the east coast. The August meeting was a presentation on EchoLink. EchoLink software allows licensed Amateur Radio stations to communicate with one another over the Internet, using voice-over-IP (VoIP) technology. 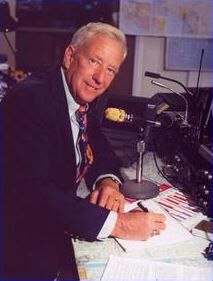 The program allows worldwide connections to be made between stations or from computer to station, greatly enhancing Amateur Radio's communications capabilities. July 30, 2005 - Noon till ??? At our July meeting Carl Gardenias - WU6D, the ARRL SCM, was our guest speaker. Carl discussed techniques for building and energizing an amateur radio club. He also listened to our suggestions and ideas making this a lively and interactive discussion. FIELD DAY is a yearly held 24-hour simulated emergency communications drill. 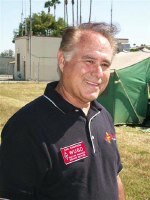 The 2005 Field Day event was held at the Joint Forces Training Base in Los Alamitos. The OCARC team ran in the 3A class using under 150 watts. We made 1,938 contacts for a total of 6,742 points, including bonus points. Thirty-eight members and guests participated. Gordon West - WB6NOA was our guest speaker at the June general meeting. ‘Gordo’ showed us what it takes to make a QSO across 2,500 miles utilizing frequencies from 144 MHz through 5.7 GHz. He presented the basics of making a tropo contact from Southern California to the islands of Hawaii. We heard recordings of actual record breaking tropo contacts. We learned how weather plays an important role in long range VHF/UHF ducting. Gordon was energetic and a pleasure to listen to. Wayne Barringer - KB6UJW, who is Chief Radio Officer for Anaheim RACES and Coordinator for the Anaheim CERT Program, talked on hurricane Charley. He was among a group of hams who traveled to Florida to aid in recovery from this devastating storm. In August of 2004, Hurricane Charley blasted the Florida coast, hitting the Punta Gorda area of Charlotte County with a fury that wreaked havoc on the communications infrastructure. So when the call came asking for amateur radio operators to assist with communications, it didn't take long to convince him to 'get on the road' and drive to/from Florida just to help. 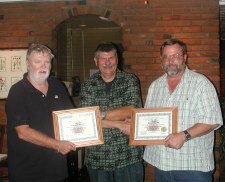 He shared his experiences in Florida and offered a unique perspective on being prepared to operate in an almost hostile environment that ultimately proved to be one of the most personally-rewarding in his entire amateur radio career. Numerous OCARC members assisted the police departments in the cities of Orange, Cerritos and Garden Grove with communications during the 2005 Baker to Vegas relay race. The April general meeting speaker was April Moell - WA6OPS. April explained about the Hospital Disaster Support Communications System that aids our Orange County hospitals during communications outages. At our March general meeting Steve Egert - K6UX of AMSAT talked on working through the ham satellites. He showed how a contact could be made with a simple VHF/UHF handheld radio by using some of the low-orbit satellites. At the February general meeting The Northern California DX Club presented a talk and video on the 2000 FOØAAA DXpedition to Clipperton Island. This video of the March 2000 DXpedition documents the island's legendary and sometimes brutal curse. From the famous DXpeditions over the last 50 years, to its chilling history of shipwreck, murder, and piracy, we joined the FOØAAA team as they re-activated one of Amateur Radio's most infamous destinations. 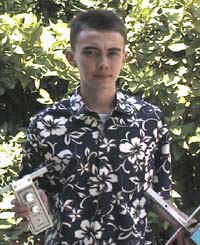 Nineteen year-old Jay Thompson - W6JAY talked on Amateur Radio Direction Finding (ARDF). Jay has won 14 medals in international competition. He gave us an idea of the equipment used and how an ARDF competition works. Jay is scheduled to participate in the upcoming 2005 USA Championship competition in Albuquerque, NM and the 2006 World Championship competition in Bulgaria. Feb 5th and Mar 5th. Apr 2nd, May 7th, Jun 4th, Jul 2nd, Aug 6th, Sep 3rd, Oct 1st, Nov 5th and Dec 3rd.